Despite technical advances in surgical resection and postoperative management of the pancreas, surgical procedures of the pancreas are associated with a high rate of complications, resulting in a relevant morbidity and mortality. Early diagnosis and management of complications associated with pancreas surgery is mandatory, favoring a multidisciplinary approach. Interventional radiology offers minimal invasive techniques to manage post-surgical complications. These procedures are highlighted in this review, including percutaneous drainage of fluid collections, percutaneous transhepatic biliary interventions, arterial embolisation and fistula embolisation. Post-surgical complications of pancreatic surgery are effectively managed by radiological procedures, offering a feasible and safe treatment with low morbidity rates. Accurate patient selection is key to an effective management of clinical situations where these interventions represent the first line approach. Radiologic procedures allow for minimal invasive treatment of postoperative complications after pancreatic surgery, reducing the time of hospitalization and the time of recovery. The technical and clinical progress in surgery of the pancreas has led to an advancement regarding resectability of pancreatic pathologies over the past decades . Pancreaticoduodenectomy and total pancreatectomy are performed in a higher number of patients more effectively, with a decrease of the mortality rate to less than 5% over the past two decades in high-volume centers [2, 3]. However, these procedures are associated with a high morbidity rate and a high percentage of perioperative complications [1, 4]. The rate of postoperative complications is reported to range between 30 and 50% according to the techniques applied . Relaparotomy is performed in 4 up to 20% of patients, and postoperative mortality in this patient cohort varies from 13 to 60% . Post-surgical complications involve the formation of inflammatory collections, peripancreatic abscess and leakage [7, 8, 9], biliary leakage [10, 11, 12, 13, 14, 15, 16], and vascular complications [17, 18]. Perioperative complications of the pancreas requiring surgical management are associated with an increased percentage of adverse events. The surgical treatment of postoperative complications is related to a mortality rate of nearly 2% and a morbidity of 30% . Advances in interventional radiology (IR) have created clinically feasible alternatives to these surgical procedures, steadily reducing the need for resurgery [20, 21, 22]. IR has advanced technically over the past decades, offering minimally invasive approaches to manage surgical complications after pancreatic surgery. A classification for grading of postoperative complications in pancreatic surgery has been introduced by Clavien and Dindo [23, 24]. This grading includes five classes: Any discrepancy from the normal postoperative course without need for pharmacologic treatment or interventions is defined as grade I. Grade II complications involve pharmacological treatment. Grade III require surgical treatment, endoscopic procedures, or radiologic interventions. Grade IV are generally life-threatening and demand intensive care unit management. Grade V result in death. Image-guided percutaneous drainage, abscess drainage, percutaneous transhepatic biliary drainage, and arterial embolization have been established as minimally invasive procedures to reduce morbidity and mortality after pancreatic surgery. These minimal invasive procedures bear the potential to improve the outcome of surgical procedures of the pancreas, and result in a shorter hospital stay and reduce the need for secondary surgical interventions [20, 22]. Fluid collections and abscess formation in the upper abdomen are frequent complications after pancreatic surgery [7, 9]. Postoperative pancreatic leaks and consecutive abscess formation represent a challenge in clinical management [25, 26, 27, 28, 29, 30, 31]. They occur in up to 30% of patients undergoing pancreatic resections . A leak at the site of surgical resection can result in abscess formation in up to 34% of distal pancreatectomies, and is associated with the formation of subhepatic and subdiaphragmatic collections . Peripancreatic fluid collections are reported to be present in up to 29% of patients after pancreatic surgery . The application of surgical drains has not led to a reduction of necessary interventional radiologic procedures or surgical exploration . On the contrary, image-guided percutaneous drainage has replaced surgical debridement in this setting, reducing the risk of additional morbidity and subsequent complications [36, 37, 38, 39]. Early diagnosis and accurate management can be provided by minimally invasive interventional procedures, including image-guided percutaneous drainage. When performing percutaneous drainage, a standard evaluation of the patient is required before intervention. Patient history should be queried for allergic reactions and changes in kidney and thyroid function. Laboratory parameters to be determined before intervention are the international normalized ratio (INR), the prothrombin time, the thrombocyte count, and creatinine levels. In case of pathologic findings, appropriate countermeasures should be undertaken. Despite the fact that an absolute contraindication for percutaneous drainage of fluid collections and percutaneous transhepatic biliary drainage does not exist, a relative contraindication to be considered is inhibition of blood coagulation. If an intraabdominal abscess or fluid retention after pancreatectomy presents with a difficult-to-reach location, considerations on the treatment approach should include the feasibility of the treatment and possible complications. Percutaneous drainage is not feasible if the pancreatic retention contains solid necrosis, as it is not drainable, and in situations where more than two repeat procedures have not led to a successful drainage of the pancreatic process . In case of difficult-to-reach abscess formations or retentions, the traversal of organs such as the liver or thoracic punctures can be considered . If a transhepatic approach is performed, the traversal should be as short as possible, maintaining a safe distance to large blood vessels or bile ducts. Attention should be payed to the fact that the side holes of the drain are contained within the retention to prevent contamination of the liver. Ultrasound (US) is readily available and allows for real-time monitoring during needle placement, without radiation exposure . In difficult-to-reach locations and in situations with limited visibility, computed tomography (CT)-guided interventions can overcome limitations of ultrasound imaging. The pathway of the drainage should be chosen on a direct route to the fluid collection while sparing surrounding vital structures. When choosing between direct puncture, Seldinger technique, and trocar technique, the limited access to peripancreatic collections often favors the Seldinger technique, which allows for highly accurate and safe image-guided needle placement . Pigtail catheters or basket drainage catheters can be used. Double-lumen sump catheters have proven to be a feasible alternative for drainage of peripancreatic fluid collections . The drainage catheter is provided with a trocar needle, allowing for fast deployment of the drainage in the tissue . In the Seldinger technique, the retention is first punctured to insert a small-caliber needle followed by a guidewire. The drainage is then advanced over the guidewire. This technique allows for exact placement in anatomically difficult-to-reach locations, as is the case when performing procedures in the retroperitoneal space. This technique requires more time than a direct puncture . However, correct positioning of the small-caliber needle can be confirmed directly by aspiration of material or by injection of contrast media. In addition, large-bore catheters can be introduced using stiff guidewires and sequential dilation of the access route. Zink et al. reported a success rate of 97.6% regarding puncture techniques in percutaneous drainage after pancreaticoduodenectomy . Cronin et al. reported on 365 patients who were evaluated on the success rate of percutaneous image-guided placement of drainage catheters to treat peripancreatic fluid collections after distal pancreatectomy using the tandem trocar technique or the Seldinger technique with a mean duration of catheter drainage of 39.7 days and a technical success rate of 100% . The primary clinical success rate in this cohort was 60%, defined as resolution of the peripancreatic fluid collection after percutaneous drainage not necessitating further interventions. Additional surgery was only necessary in 3 patients, confirming the technique to be safe and clinically effective. In this study, the need for catheter manipulation and the chosen catheter size were significantly associated with catheter failure, which was explained by the fact that pancreatic collections were frequently viscous. In addition, endoscopic retrograde cholangiopancreatography (ERCP)-guided stent placement has proven to be beneficial in occlusion of pancreatic leaks, avoiding an open incision or surgical drainage placement [43, 44, 45]. The endoscope is used to locate the fluid collection or pseudocyst and to identify surrounding anatomical landmarks or adjacent vital structures. A transpapillary or transmural puncture into the collection is then performed, depending on the location and on a possible communication with the pancreatic duct system. After establishing a wire access into the collection, dilatation and stent placement enable effective drainage. One study of 92 patients undergoing endoscopic drainage reported a technical success rate of 97%, a mortality rate of 1%, and a complication rate of 9% . The therapeutic management of pancreatic leaks includes transpapillary pancreatic duct stenting in order to bridge a leak. If the pancreatic duct is disconnected, transluminal stenting is indicated . However, stent migration and pancreatitis are significantly associated with stent placement [10, 48]. Major complications during drainage placement or postoperatively include hemorrhage, septic shock, enteric fistula, peritonitis, pneumothorax, and pericatheter leakage. Complication rates of up to 15% are reported in the literature . In comparison, the rate of biliary leakage after surgery ranges from 0.8 to 12% . Most leakages occur at the site of bilioenteric anastomosis, resulting in peritonitis, bilomas, or fistulas . Biliary leaks can result in formation of inflammatory collections, creating the need for percutaneous transhepatic biliary drainage, which has proven to be effective [12, 52, 53]. Bile leaks are defined by the International Study Group of Liver Surgery as fluid with increased bilirubin concentration at least 3‑times greater than the serum bilirubin concentration at that time . Bilioenteric reconstruction after pancreaticoduodenectomy complicates postoperative endoscopic investigation of the biliary tree. A percutaneous transhepatic approach is an alternative to treat possible complications, performing percutaneous transhepatic cholangiography with percutaneous transhepatic biliary drainage (PTC/PTBD). This procedure is effective in the treatment of biliary leaks, which are present in 3 to 4% of patients undergoing surgical resection [11, 16]. Biliary leaks occur most often at the bilioenteric anastomosis, rarely at the stump of the cystic duct. Percutaneous transhepatic cholangiography is indicated if endoscopic retrograde cholangiopancreatography is not effective or surgical resections prevent endoscopic access [55, 56]. The biliary system is punctured under US guidance, aiming at a peripheral bile duct. A 21- or 22-gauge Chiba needle is used to puncture the liver and a peripheral intrahepatic biliary duct. Following a diagnostic cholangiogram, a thin guidewire is introduced through the 22G needle to catheterize the biliary tree. If necessary, another biliary duct can be chosen to gain a more favorable access to reach the biliary leak. Once the intrahepatic biliary tree is catheterized, a hydrophilic guidewire is inserted into the small bowel distal to the biliary leak. A 4F or 5F catheter is then pushed over the guidewire into the small bowel. The flexible guidewire is then replaced by a stiffer one, in order to insert a catheter for drainage (diameter up to 12F). Catheter sideholes should be positioned proximal and distal to the anastomotic leak, in order to reduce pressure gradients. The exact positioning can be confirmed by imaging following contrast media application. Catheters can be left in place for 4 to 8 weeks . In order to achieve closure of a biliary leak, long-term drainage is necessary, requiring close surveillance of the patient, fluoroscopic control of the catheter position and function, as well as multiple exchanges of drainage catheters. These measures are performed in order to avoid catheter occlusion. Covered stents can be inserted to seal a biliary leak while providing biliary drainage. In most cases, stents of 7 to 10 mm diameter are appropriate. Despite considerations on the local diameter of the biliary duct, the length of the leakage and possible landing zones have to be evaluated. Self-expandable metallic stents have proven to be feasible in this indication . Fully covered metal stents can be applied in this setting, especially in more complex leaks. However, long-term results are discouraging, since covered and non-covered stents may migrate or occlude within 3–6 months [13, 56]. In patients who have undergone Whipple surgery, endoscopic access may be difficult or even impossible. Thus, an occluded stent has to be recanalized by another transhepatic procedure. Therefore, plastic, metal or covered stents should only be used in restricted cases. The technical success rate is reported to be between 65 and 90%, with a complication rate between 2 and 4%, including liver hematoma, biliary stenosis, ductal perforation, and metabolic acidosis from bile loss . Biliary fistulas differ from biliary leaks, as they occur mainly if the biliary duct system is obliterated and gains connection to the abdominal wall and skin level, which can be the case in patients who underwent surgical drainage placement. These biliary fistulas can effectively be managed by interventional radiologic procedures. Placement of an occlusion balloon allows for obstruction of the biliary tract proximal to the fistula, and is used in combination with external drainage of the bile . Surgical repair of biliary strictures leads to high morbidity and mortality rates, 28 and 2.6%, respectively . Percutaneous drainage and stent implantation are effective alternatives and can be repeated when required . Disadvantages of stent placement include the need for stent removal to prevent inflammatory reaction and stone formation. Biodegradable stents may overcome this limitation and do not require removal . Involvement of the portal and mesenteric veins in malignant disease may lead to complications after pancreas surgery, especially if vascular reconstruction has been performed . However venous complications after pancreatic surgery are extremely rare, and no large-scale studies are available in the literature to verify a standard treatment approach. Up to now, only case reports on postoperative venous complications after pancreatic surgery have been published [61, 62, 63]. Possible treatment approaches include direct and indirect thrombolysis, venous stenting, and mechanical thrombectomy . Anastomotic stenosis after reconstruction of the portal vein is generally not feasible for endovascular treatment because of the increased risk of rupture . Pancreatic fistulas are a common complication after pancreatic surgery . Two large studies have reported an incidence of 9 to 29% [67, 68]. Despite advances in surgical techniques, the presence of pancreatic fistula resulting from an insufficiency at the site of pancreatic anastomosis is associated with a mortality of up to 10% . The definition of pancreatic fistula varies in the literature, hampering an objective comparison of surgical outcome. Pancreatic fistula is defined as any measurable fluid collection with an amylase content greater than 3 times the serum amylase activity after postoperative day 3, according to the criteria of the International Study Group on Pancreatic Fistula (ISGPF) . The ISGPF defines the severity of pancreatic fistula by taking into account the impact on the clinical course of the patient. Grade A fistula are treated conservatively, and patients are asymptomatic. Grade B cases may require interventional procedures, with patients being poorly symptomatic. Grade C fistula may be life-threatening or require emergency surgery. Patients may develop abscess, peritonitis, sepsis, and hemorrhage. These conditions occur in 10 to 30% of patients, with a mortality rate of 2 to 10% . Fuks et al. 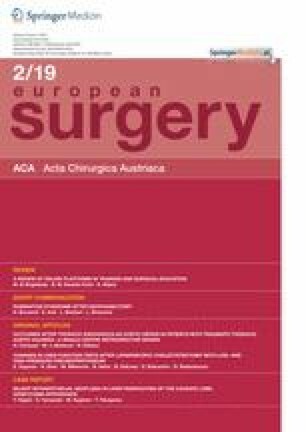 evaluated 680 consecutive patients undergoing pancreatoduodenectomy for the presence of pancreatic fistula, and found three discriminant risk factors to predict grade C pancreatic fistula, including perioperative soft pancreatic parenchyma, perioperative transfusion and postoperative bleeding . These risk factors were associated with a positive predictive value of 100% and a negative predictive value of 70.75%, defining a high-risk group of patients. Pancreatic fistulas often lead to fluid collections, and can be managed non-surgically in over 90% of cases . Percutaneous drainage helps to evacuate the retention and to occlude the fistula. If the fistula does not heal despite long-term drainage, the communication pancreatic duct can be occluded just proximal to the leak. Catheterization of the leaking pancreatic duct can be very difficult or impossible. Thus, embolization of the fistula should be performed using coils and glues . Following distal pancreatic resection, endoscopic sphincterotomy of the papilla of Vater may be performed to improve outflow of the main pancreatic duct. Hemorrhages account for less than 10% of complications after pancreatoduodenectomy but are responsible for up to 38% of deaths . Postoperative hemorrhage is defined according to the International Study Group of Pancreatic Surgery criteria . The International Study Group of Pancreatic Surgery has introduced a grading scale considering hemorrhage by onset, location, and severity. Early hemorrhage occurs within 24 h of surgery, mainly associated with technical failures regarding the gastroduodenal artery stump [74, 75]. Early bleeding requires surgical repair of these technical failures in combination with a coagulopathy. Late hemorrhage is defined by an onset more than 24 h after surgery, and is associated with vascular erosion in the mesenteric vasculature and formation of a pseudoaneurysm of the gastroduodenal artery stump ([76, 77]; Fig. 1). If patients are hemodynamically stable, CT is crucial to localize the site of bleeding. A triple-phase CT with application of iodinated contrast media is standard when evaluating a possible bleeding complication after pancreatic surgery. Multiplanar reformatting aids in planning of interventional procedures. Unenhanced images aid in differentiating beam-hardening artefacts from contrast media deposition. Sentinel bleeding has been defined as isolated bleeding from an abdominal drain after pancreatectomy, and is commonly associated with sepsis or anastomotic dehiscence, with risk of a major postpancreatectomy hemorrhage, requiring immediate evaluation and treatment . Spasm and vascular irregularity can be indirect signs of bleeding. Selective angiography can assist in localizing the bleeding . Different techniques are used to stop bleeding, including proximal embolization in order to reduce blood flow to the bleeding vessel . Occlusion of the bleeding vessel at the site of bleeding results in optimal bleeding control. However, this may be impossible due to anatomic reasons. If collateral vessels feed the bleeding artery and the bleeding site cannot be catheterized, the arterial segment proximal and distal to the bleeding site has to be occluded, performing an isolation technique . Permanent embolization materials should be used to control bleeding. Non-absorbable materials include polyvinylic alcohol particles, metallic coils, and locally acting liquid embolisation materials like Onyx® (Medtronic, Minneapolis, MN). Detachable coils are highly radiopaque and can be precisely positioned in the target vessel. However, coils require a normal blood coagulation system for vascular occlusion and cannot be delivered into very small distal arteries (<2 mm). PVA particles or highly viscous liquid embolization materials are better options if the blood coagulation is disturbed or the bleeding originates from arteries which cannot be catheterized. Distal embolization of very small arteries or capillaries using liquid embolization materials like absolute alcohol or distally acting glues should be avoided, since this may lead to tissue necrosis causing additional complications. If the bleeding site is located in a major artery, for example the superior mesenteric or the celiac trunk, stent grafting is the best option for treatment . Stent grafting preserves perfusion, but is challenging in tortuous vessels . A systematic review of studies on late postpancreatectomy hemorrhages reported an incidence of 3.3% in 7400 included patients . The most frequent locations of bleedings included the abdominal cavity and the gastrointestinal tract, and sentinel bleedings were observed in 45% of the patients. The only risk factor that was identified for bleeding was the presence of pancreatic leak in 50% of patients with delayed bleeding. 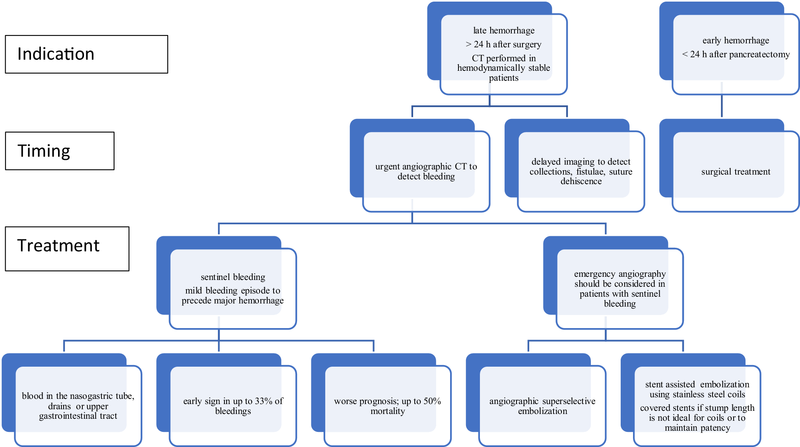 As bleedings with acute onset after pancreatic surgery, within 24 to 48 h, are mainly treated surgically, endovascular treatment has its role in the management of late onset bleedings. In this systematic review, angiography was performed in 55% of the patients with delayed bleeding, and the source of bleeding was localized in 88% of these, including ruptured visceral arteries, and erosion of the pancreatic stump and the enterojejunostomy. Intraluminal hemorrhage leads to hematemesis, while extraluminal bleeding presents as intraabdominal hematoma or discharge of blood from a surgical drain. While hemodynamically instable patients need to undergo laparotomy, hemodynamically stable patients should undergo CT at the time of active bleeding, in order to achieve high sensitivity. In this systematic review, success rate of the surgical approach was 76%, while interventional radiology reached 80% . Corresponding mortality rates were 47 and 22%, respectively. Angiography was effective in localizing the bleeding. False-negative findings could be due to the intermittent character of bleeding, and Yekebas et al. suggested repeat angiography after 6 to 24 h in hemodynamically stable patients to detect initially occult bleeding . Endovascular complication rates in patients after pancreatectomy differ from 14 to 36% . No data are available on the comparison of rescue rates from different treatment approaches after complicated pancreatectomy. The studies reporting larger patient cohorts and results from longer observational periods clearly state the importance of accurate timing and fast work-up of complications after pancreatic surgery. When angiographic interventions are performed, centers with large hospital volume report better outcomes and more effective treatment, especially if interventional radiologists are available 24/7. Amrani et al. have reported that the failure-to-rescue rate depends mainly on the hospital volume and is mainly associated with renal complications (40.2%), shock (36.4%), cardiac complications (35.1%), and digestive complications (33.9%) . A recent report has shown an influence of various factors on the failure-to-rescue rate after complicated pancreatectomy, including patient factors such as age, presence of ascites, and presence of malignant disease . The multidisciplinary approach to treat post-surgical complications of the pancreas is facilitated by minimally invasive radiological procedures, shortening recovery times and reducing morbidity. Interventional radiological procedures represent the first-line treatment of post-surgical complications. The techniques have been described as feasible and safe. Radiologic procedures are equally effective yet less invasive in comparison to surgery. Patient selection and an interdisciplinary approach are the keys to successful intervention. D. Putzer, P. Schullian, S. Stättner, F. Primavesi, E. Braunwarth, M. Fodor, B. Cardini, T. Resch, R. Oberhuber, M. Maglione, C. Margreiter, S. Schneeberger, D. Öfner, R. Bale, and W. Jaschke declare that they have no competing interests.